On that score, just fyi, the US stock market is not the US economy. A lot of people on Old Wall Street disagree with me on that – and if you can’t tell already, I really want to have this debate in the arena of American public opinion! Strong Dollar = Strong America. Period. That doesn’t mean that the US Dollar has to go up and the stock market down for me to be right on this. On the contrary, I think this country will only get it really right when both its currency and stock markets are going up together. That’s when the 99% get paid. Stop whining and start winning. American winners like Ford, Microsoft, and Apple didn’t become the leaders of innovation and job creation on some cochamamy central plan for a weak currency. They did it by dealing with the globally interconnected game that they were in, and finding a way to win. 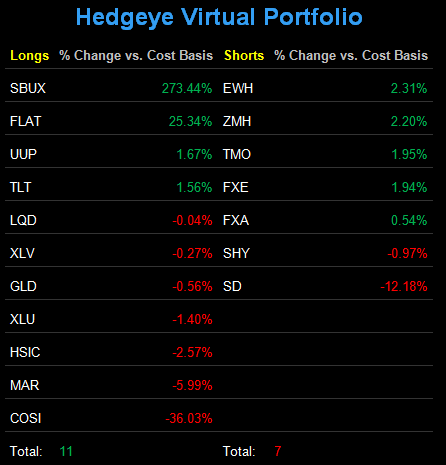 I started the week at 0% asset allocation to US Equities as I came into the week short the SP500 (SPY). Yesterday, I did what the process told me to do: started buying Healthcare (XLV), and sold some Fixed Income exposure (which was oversized to start the week at 30%, with my max being 33% to one asset class). 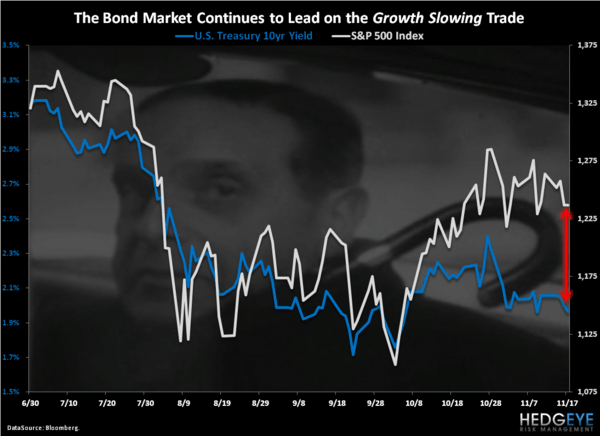 TLT – Growth Slowing, globally, is going to continue to have an impact on US Growth Slowing. Immediate-term target for UST 10-year yields is 1.98% so that means it’s time to take my time selling some bonds and buying some stocks (see Chart of The Day). FLAT – Growth Slowing. Period. We’ve had this position on since February of 2011, so the buy-and-hold crowd can give me a golf clap for having the conviction to stay with our highest conviction idea relative to consensus in January 2011. LQD – Are Corporate balance sheets “flush with cash” – no doubt, but some of them are flush with debt too – so we want to be careful with this position as the US bankruptcy cycle accelerates (see chart of American Airlines – AMR). UUP – Domestically, we think the US Presidential cycle puts Bernanke in a box. Internationally, we think the Europeans are going to cut rates alongside most central bankers in Asia and Latin America. Strong Dollar = Strong America. XLU – next to owning the top performing major currency in November (USD), we want to continue to have exposure to American cash dividend yields. This is the highest dividend yielding S&P Sector ETF and remains in a Bullish Formation in our model. XLV – buying it right is what matters most here (yesterday was a good re-entry point), but our Healthcare Team is bullish on the intermediate-term TREND outlook for consumption oriented domestic Healthcare stocks (think dental and Strong Dollar). GLD – again, you want to buy it right and manage your risk around what looks to be a relatively predictable range ($167.21-$175.98). As long as real-interest rates on American savings accounts remain negative, Gold works for absolute return. I know it terrifies Old Wall Street to think that we can be as bearish as we’ve been on Growth Slowing, but still find a way to make money on it on the long side. Ray Dalio has done it in both 2008 and 2011 and so have we. Winners win. Being perma bullish or bearish isn’t a risk management process; neither is hope for the next Big Government Intervention. I think we are having a generational moment in this country where the winners can take this country’s leadership reigns back from the whiners. That’s the long-term America I think we can all believe in. My immediate-term support and resistance ranges for Gold, Oil, France, Germany, and the SP500 are now $1, $97.69-102.11, 3003-3089, 5, and 1, respectively.